The patent is the ultimate seismic system that will change the world's seismic design method of construction . We have invented a method and mechanism that joins the roof ( roof ) construction with the ground . This pretension between the roof of the structure and the soil becomes world's first time , and stops deformation generated in the building during the earthquake , so ensure absolute durability. Apply placement in all building projects are under construction , but and in many existing structures , ensuring absolute seismic protection. For example, houses, skyscrapers , dams , windmills , bridges , roads. 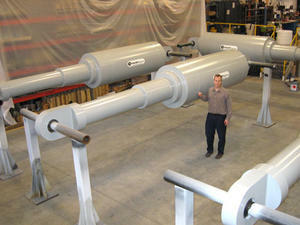 Even protects and lightweight construction of tornadoes . Use also as anchor for the support of ground slope on highways . The principal object of the hydraulic tie rod for construction projects of the present invention as well as of the method for constructing building structures utilizing the hydraulic tie rod of the present invention is to minimise the aforesaid problems associated with the safety of construction structures in the event of natural phenomena such as earthquakes, hurricanes and very high lateral winds. According to the present invention, this can be achieved by a continuous pre-stressing (pulling) of both the building structure towards the ground and of the ground towards the structure, making these two parts one body like a sandwich. Said pre-stressing is applied by means of the mechanism of the hydraulic tie rod for construction projects. Said mechanism comprises a steel cable crossing freely in the centre the structure's vertical support elements and also the length of a drilling beneath them. Said steel cable's lower end is tied to an anchor-type mechanism that is embedded into the walls of the drilling to prevent it from being uplifted. Said steel cable's top end is tied to a hydraulic pulling mechanism, exerting a continuous uplifting force. The pulling force applied to the steel cable by means of the hydraulic mechanism and the reaction to such pulling from the fixed anchor at the other end of it generate the desired compression in the construction project. The skeleton of a building consists of the columns (vertical parts) and the girders and slabs (horizontal parts). The girders and slabs are joined at the nodes. Under normal conditions, all loading is vertical. When an earthquake occurs, additional horizontal loading is placed on the skeleton. The resultant effect of horizontal plus vertical loading puts strain on the nodes. It alters their angle from 90 degrees, creating at times acute and at other times obtuse angles. The vertical static loads equilibrate with the reaction of the ground. The horizontal earthquake load exerts a lifting effect on the bases of the columns. In addition, due to the elasticity of the main body of the columns, the earthquake acts by shifting the heights of each plate by a different amplitude and a different phase. That is, the upper plates shift more than the lower ones. The modal shifts of the skeleton are many, so many that the differing, shifting directions of the earthquake deform and destroy the skeleton. The ideal situation would be if we could construct a building skeleton where, during an earthquake all the plates would shift by the same amplitude as the ground without differing phases. In this way the shape will be preserved and we would not have any deformation of the frame, hence no damage. The research I have carried out has resulted in the creation of an anti- seismic design for buildings which achieves exactly this result. I have succeeded in doing this by constructing large elongated ridged columns shaped -, +, Γ or T to which a pulling force is applied from the roof and from the ground, applying bilateral pressure to the entire column. This force acts to prevent bilateral shifting of the columns and curvature at their bases so preventing the deformation which occurs throughout the whole structure during an earthquake. In an earthquake, the columns lose their eccentricity and their bases are lifted, creating twisting in all of the nodes of the structure. There is a limit to the eccentricity, that is, there is a limit to the surface area of the base which is lifted by the rollover moment. To minimise the twisting of the bases, we place strong foot girders in the columns. In the large longitudinal columns (walls), due to the large moments which occur during an earthquake, it is practically impossible to prevent rotation with the classical way of construction of the foot girders. The following result occurs with this lifting of the base in combination with the elasticity. When one column of the frame lifts one end of the beam upwards, at the same time the other column at its other end moves violently downwards. This stresses the beam and has the tendency to twist it in different directions at the two ends, deforming its body in an S shape.The same deformation occurs with the columns also, due to the twisting of the nodes and the differential phase shift of vertical plates. In order to prevent the lifting of the base, we clamp the base of the structure to the ground using the patented mechanism. However, if we want to prevent the lifting of the whole columnar structure which stems from the lifting of its base as well as from the elasticity of its main body, then the best point for enforcing an opposing, balancing force is the roof. This opposing tendency on the roof must come from an external source and not applied from within the structure. This external source is the ground underneath the base. From here the external force is applied. Underneath the base of the structure, we drill a hole into the ground and clamp it with the patented anchor. With the aid of a cable which passes freely through a pipe in the column, we transfer this force which we obtained from the ground up to the roof. At this point in the roof, we insert a stop with a screw to prevent the raising of the roof of the longitudinal columns which happens during an earthquake and deforms all the plates. In this way, we control the oscillation of whole structure. That is, the deformity which the structural failure causes. With this method, we do not see changes in the form of the structure, because it maintains the same shape it had prior to and during the earthquake. The reaction of the mechanism to the raising of the roof of the longitudinal column and the opposing reaction of the at the bottom part of the base, divert the lateral load of the earthquake into the strong vertical section. With this diversion of the lateral load of the earthquake to the vertical columns, the twisting of the nodes is abolished because the lateral loadings of the earthquake are 100% borne along the length of the columns, so it is impossible for them to twist in their main sections. In the experiments I have carried out in actual scale earthquake acceleration of 1.77g and amplitude over 0.11 in a two story building model to scale 1:7.14, the difference in the model with and without the patented mechanism can clearly be seen. Can Obama be the AntiChrist? ultimate theory = ultimate mind-wipe ? Can Widespread Antibiotic Use Damage our Environments? What amplitude range for seismic P-waves? with the patented mechanism but clamped between the base and the seismic base (Not like the first experiment. Have you already filed a patent application for this? Because if not, then by publishing it here you have just destroyed any chance of patenting it. That's what I was thinking, I'm no expert but I would have thought seismic's posts would count as "prior art" and invalidate any subsequent patent application. Has a very positive opinion for hydraulic tractor. From what the examiner says that I have something patentably new and useful. Improved anchoring means comprising expansion anchors in combination with hydraulic tensioning means to keep the building tightly tethered to the ground. This would also be good for hurricane country, like the US Gulf Coast. Filing in Αmerica at the patent office. Last edited by seismic; October 4th, 2014 at 12:49 AM. I don't really understand what's going on in those videos. The structures don't seem to have an anchor going down through the middle of the structure like the illustration showed. What is the difference between the experiments where the structure failed and the one where it did not fail? They look the same to me. How do you know the anchor won't pull out of the ground in an actual earthquake? In the first video, what is happening immediately after the earthquake. It seems to show the building rocking back and forth. Why does that happen? Last edited by Harold14370; October 4th, 2014 at 02:29 AM. The seismic base represents the foundation soil. In experiments there is no anchor. There is a screw which is screwed with screws bolts on top of the roof and below the seismic base. The first experiment has screws and is screwed above the roof and and below the seismic base. In the third experiment, not screwed at all with the seismic base. This makes the difference. The first video is another method of fixing. If you have a moly bolt, and screw it to the wall you can not push through or pull it out. The same system with the screw of the wall is the patent system. Last edited by seismic; October 4th, 2014 at 08:59 AM. But if you screw the screws to screws that aren't screwed then you're screwed. Earthquakes don't kill people. People's houses in the midst of earthquakes kill people. Look at the statistics—or the photographs—and you'll know that the vast majority of fatalities from earthquakes large or small come from buildings, or parts of buildings, falling on people. That's the general idea behind the levitating house developed by the Japanese company Air Danshin. The product of inventor Shoichi Sakamoto, the house sits, during more stable times, on a deflated air bag. When sensors feel a tremor, they switch on a compressor within a second. The compressor pumps air into an airbag, inflating it within a few more seconds, and ultimately lifting the entire house a good three centimeters off its supposedly earthquake-proof concrete foundation. There the structure will hover, its inhabitants able to casually go about their business, for the duration of the quake. Then the airbag deflates and the house gently settles back down. It is easiest to see this principle at work by referring directly to the most widely used of these advanced techniques, which is known as base isolation. A base isolated structure is supported by a series of bearing pads which are placed between the building and the building's foundation. (See Figure 1) A variety of different types of base isolation bearing pads have now been developed. For our example, we'll discuss lead–rubber bearings. These are among the frequently–used types of base isolation bearings. (See Figure 2) A lead–rubber bearing is made from layers of	rubber sandwiched together with layers of steel. In the middle of the bearing is a solid lead "plug." On top and bottom, the bearing is fitted with steel plates which are used to attach the bearing to the building and foundation. The bearing is very stiff and strong in the vertical direction, but flexible in the horizontal direction. I make myself clear ... you get it now? What does this invention achieve which is not achieved with the current technology? Current technology simply secures the structure to the ground. My invention unites it with the ground making these two as one (like a sandwich). For me, this uniting of the structure with the ground beneficially changes the direction and type of forces which act upon the structure dynamically during an earthquake. a) Shearing stress is created mainly on the vertical supporting components during earthquake acceleration due to the inertia of the mass. Question: Is the shearing stress the same in all of the supporting components? - They have to handle (in movement) a greater mass which necessitates greater inertia, thereby creating greater shearing on the cross section plan. - The ground floor components are more rigid. All of the other supporting components (except for those of the ground floor) have a certain amount of elasticity in the nodes and supporting components which is beneficial in that they absorb the force of the earthquake due to transfer of this force into heat. However, this beneficial absorption of energy is cancelled to a greater degree by the components of the ground floor for one main reason. Underneath the components (columns) on the ground floor the base is inflexible (because it is usually under the ground). It therefore transfers wholly the acceleration of the earthquake (and in this way shearing stress is also increased). At the components (columns) of the upper floors the same does not occur because the components of the ground floor have already absorbed part of the force and less energy is transferred upwards to the more elastic components. Because of this and due to the increased mass load which has to be handled we see greatly increased shearing stresses on the ground floor components. This explains why the majority of failures happen on the ground floor. This issue can be resolved by increasing the cross section plan of the components of the ground floor. But if we do this then another problem occurs; we lose the elasticity in the components (and in this way we also lose the damping of the acceleration). Moment of the nodes also acts to create stress on the horizontal and vertical supporting components by shearing stress and occurs for the following reason. During the acceleration of an earthquake we know that there is inertia of the load bearing elements but in addition inertia of the bearing mass has to be handled. These burden the vertical components with horizontal shearing stress. In a high rise building, the vertical components are united from the first up to the top floor. The structural integrity of all the components of the load bearing elements (columns, girders, slabs) is improved when these are joined at the node points. During the inertia of the bearing elements, these node points react with moment which taxes the vertical and horizontal supporting elements with shearing stresses. If the design is not correct, this results in failure of the vertical elements which are brittle but not the horizontal. The reason for this is that the vertical elements (columns) have a smaller cross section by comparison to the girders. The girders mass along the length forms a structural unit with the slab so that it is considered a unified body stronger than the vertical element. If we consider that each column bears at least two girders, we understand the difference in endurance (with regards to the shearing) between the column and the horizontal bearing element. During oscillation of a tall building, there is the tendency for it to lift up off the ground on one side due to moment, creating a gap underneath the back foundations. That is, the front columns try to lift up the back ones due to the structural unity that they have. This unity is provided by the girders. This gap cancels the resistance which is present between the ground and building base as the base which was securing the building is now in mid-air. Of course, this event never really happens in reality because the static load of the structure during the lifting of one side immobilizes the column with the base to the ground creating moment of the nodes. These moments create slanted shearing of the cross section of the vertical element which cannot withstand the load and we have cancelling of the structural unity of the building. In the first minutes of the experiment, we see a wooden structure (building skeleton) which, during inertia oscillates and lifts up on one side and then on the other alternately. This occurs because it is light and the nodes withstand the moment which is created from the static weight of the unsupported side of the structure. As soon as we place the static load of the two bricks, it still oscillates but the base does not lift up on either side. In this situation the nodes can no longer withstand the additional load of the bricks. Considering the analysis I have done above, we see why a structure fails when the limits of the design are surpassed. There is no absolute anti-seismic design. Current Greek anti-seismic systems have a certain amount of endurance but from this point onwards, the truth is that they are fragile. In my opinion the endurance here has particular limits due to my reasoning above. This phenomenon can be resolved by increasing the cross section plan of the ground floor components. If we do this though, another problem emerges; as stated before; we lose elasticity of the components (and the depreciation of the acceleration). The solution can be seen in the continuation of the experiment shown in the link above as well as in the explanation below. For the pre-stressing or clamping of the structure with the ground to operate beneficially during an earthquake, a large cross section plan of the supporting components is necessary as well as very durable materials if it is to provide additional benefits. Pre fabricated houses offer these two necessary components as they are constructed completely from fortified concrete. The problem of loose ground (c) is resolved by using Radiere together with the specialised hydraulic traction mechanism. This improves the durability of the ground and provides additional support to the foundations. Imagine PREFABRICATED houses which are made of fortified concrete and secured (screwed) at their four corners with this seismic base … even if they are turned upside down, nothing can happen to them. When we do not screw down the base, what will happen? If we have tall buildings completed constructed from fortified concrete, these will withstand the shearing stress but their nodes will have increased load due to the gap (discussed above) which is created under the base during second moment of the area as well as the greater static load which they bear. The combination of moment and static load creates slanting cracks in the walls. …. It cannot lift up on one side during second moment of the area and in this way we avoid moment of the nodes. I believe that with this method, prefabricated houses can be placed in towns. Until now these houses have only been suitable for rural areas. The main reason for this is that the law does not allow them to be built more than two stories high. If they become invulnerable during an earthquake and they can withstand the force with many stories then their construction will be permitted in towns. At this moment, they are not permitted in towns because if, in a town ten story buildings are allowed and prefabricated ones can only be constructed up to two stories, financially it is not feasible to lose the possibility of another eight stories. If I enable them to withstand earthquakes, then conventional methods of construction will be dispensed due to the fact that prefabricated structures are 30-50% cheaper because they are industrially produced. This way the manufacturers will profit from this change. That is, it can improve the density of loose ground as well as not allowing the structure to move upwards (during oscillation) or downwards (during subsidence of the ground). I have already mentioned the placement methods in existing and buildings under construction as well as other types of structures such as dams and bridges etc. The patent is also appropriate also for the protection of lightweight buildings during tornadoes which are seen mostly in the United States . It is easiest to see this principle at work by referring directly to the most widely used of these advanced techniques, which is known as base isolation. A base isolated structure is supported by a series of bearing pads which are placed between the building and the building's foundation. (See Figure 1) A variety of different types of base isolation bearing pads have now been developed. For our example, we'll discuss lead–rubber bearings. These are among the frequently–used types of base isolation bearings. (See Figure 2) A lead–rubber bearing is made from layers of rubber sandwiched together with layers of steel. In the middle of the bearing is a solid lead "plug." On top and bottom, the bearing is fitted with steel plates which are used to attach the bearing to the building and foundation. The bearing is very stiff and strong in the vertical direction, but flexible in the horizontal direction. My is a cheaper and safer for large structures... good view around for very large windows. Is a building, in another building. The outside building is elastic. b) There is no phase difference on floors. The first, the middle and the LAST plate have the same amplitude. Stops the deformation and failure. An effort of this kind would help to speed up the research into low-cost, earthquake-proof, anticyclonic, so that work can begin on building cheaper housing that can withstand any unforeseen happenings. Last edited by seismic; October 4th, 2014 at 05:05 PM. Tell me where you disagree. Last edited by seismic; October 4th, 2014 at 02:37 PM. Let's really talk about absolute earthquake technology. It is a method that uses a mechanism for joining the upper ends of a reinforced concrete wall with the ground in order to send in it the upward tensions created by the torque of the wall to prevent large displacements and tensions of the wearer occurring during the earthquake . We have placed on a table two columns, one column screwed on the table, and the other simply put on the table. If one shifts on the table, the unbolted column will be overthrown. The bolted column withstands the lateral loading. We do exactly the same in every column of a building to withstand more lateral earthquake loading. That is done, by simply screwing it to the ground. Basically, when the roof is connected to the ground through the patent rope, it limits the displacements of the floors (ie the drifts) and thus the intensity, which develops throughout the carrier, is limited. Tensioning between of the upper edge of the walls with the earth reduces the displacements responsible for all the stresses that develop on the structural carrier. 1)The consolidation of the nodes of highest level of the walls with the ground, using the mechanism of the invention, deflects the upward tensions created by the wall overturning torque transporting them freely and directly from the roof into the ground and in this way stops the displacements responsible for all growing tensions on the body of the bearing elements which they cause inelastic bending deformations and failures in a major earthquake. 5) The wall also receives horizontal shear forces. Apply tension at all edges of the wall with the patent mechanism increases the ability to horizontal shear forces. Answer. By limiting the walls displacements responsible for all the above tensions. Question. How do we manage do that? Answer . By joining their upper ends with the ground. Answer . By imposing compression in cross sections in the context of overlapping. Question. Where? upward tensions of the walls are driven developed from bending and tipping torque? Answer . Received by the mechanism of the invention from the roof and diverted driven (by the tendon which passes freely the wall through a pipe ) in the ground, removing these tensions from the members of the reinforced concrete. Answer . Only compressive tensions at the ends, above, and below. Tension stresses they do not exist anymore because it is receives by the free tendon and sends them into the ground. This is the reason that the tendon passes freely the walls through a pipe. Question. How does the embedding of anchoring manage to undertake upward and downward tensions? Answer . The mechanism is so constructed to convert the transverse traction in pressure to the slopes of the drilling where it is mounted. This pressure increases adhesion ensuring a strong anchorage on the drilling slopes capable of taking upward tensions. Maintaining this intensity we fill the borehole with concrete to create a concrete pile to receive and downward tensions. It is initially applied between the foundation surface and the anchoring mechanism so, to apply strong consolidation without burdening the construction with large loads. After ensuring a strong consolidation in the ground we have the ability to apply a second lower intensity on the roof to improve shear strength of the wall. I find it very strange to have an inexpensive, clever solution to the problems of the earthquake in front of your eyes and you whistle indifferently! One of the major design errors, towards the dynamic response of structures to seismic displacements. The cooperation between concrete and steel in a Reinforced Concrete structure is achieved with relevance. By the term - Relevance - is defined the combined action of the mechanisms that prevent the relative sliding between the bars of the reinforcement and the concrete surrounding it. The mechanisms of relevance is adhesion, friction, and, in the case of steel bars with ribs cartilage , the resistance of the concrete trapped between the ribs cartilage. The combined action of these mechanisms is considered to be equivalent to the development of shear stresses on the concrete and steel contact surface. When these stresses reach their limit value, occurs destruction of relevance in the form of rupturing the concrete along the bars and detachment of the steel rods. a) The bend of the wall, (b) the critical failure area, (the critical failure area does not appear with this method ) (c) the potential difference of the relevance mechanism observed in the body of the wall near the base there in the critical fault area between left and right torque. d) The connection of the upper edges of the wall with the ground beneath the foundation deflects the upward wall tensions (created by torque, roll over the wall) into the ground by removing large stresses from the structure.